In addition to physically being on the land, support from afar is also needed year-round to sustain the Unist’ot’en. With recent events, help is needed for fundraising for legal expenses. There has been an overwhelming amount of support coming towards the Wet’suwet’en recently, all is very appreciated. One way to support is hosting fundraisers! Do not use funds raised for personal gain or to supplement your income (yes, even if you worked really hard on it!). Do not advertise events as Unist’ot’en or Wet’suwet’en benefits unless 100% of funds raised are donated. When overhead costs are unavoidable and will yield greater funds raised than cost free events, ensure that upfront investment will only make up one quarter or less of the projected funds raised. You might consider estimating the return with social media events pages that indicate the attendance and/or event ticket pre-sales. The best places to donate the money you raised are directly through fundraiser sites: DONATE page and Unistot’en Legal Fund. This ensures the money gets there the quickest and most secure way. Close the loop, post-event and communicate to camp hosts the amount of funds raised and when they are deposited. For large fundraisers, please send along a photo of the solidarity efforts, noting if they can be posted on our website or social media (make sure you have consent). We love to see our allies! The Unist’ot’en are not a non-profit or NGO, so your donations will not be tax-deductible. We encourage the involvement of local territory holders to open/approve the event on their territory, or at minimum, an acknowledgement of whose traditional territory the work is being conducted on. If this is a joint event in which funds are to be split with another Wet’suwet’en group, ensure proper consent from all parties. Refer to allied pages like Gidumt’en Access Point and go through the authorized fundraising site here. Thank you for helping to decolonize/support indigenous sovereignty, and correcting resource imbalances! Please click here to report any fraudulent Unist’ot’en fundraisers. Hosted the Unist’ot’en for speaking engagements at colleges and community centers. Videoconferencing is preferred to minimize the carbon footprint and travel costs, as well as minimize the absence of our spokespeople or house members on the frontlines. We may consider in-person events if costs are covered, it is a high-yielding event (or cluster of events), and adequate coverage on the territory can be arranged. Can you do something from this list? Or do you have a creative idea of your own that will support the Unist’ot’en Camp? Get in touch with the camp hosts to get their consent and input on your solidarity event! (Due to the heavy volume of requests and messages the hosts receive, response may be delayed – please allow for at minimum a week’s time for a response. Events should be planned with more than a week of lead time). 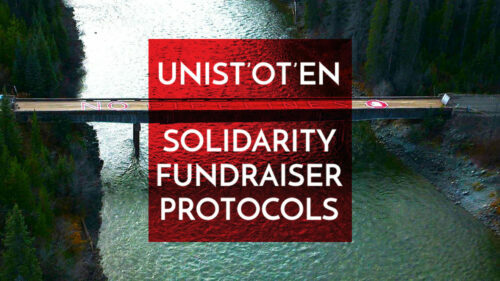 Click here for more ways to support the Unist’ot’en.